Hollyhocks (Alcea rosea) are a classic cottage garden flower with tall stalks of bright blooms throughout the summer months. They typically seed themselves in the garden, making it an easy way to provide seasonal color. Hollyhocks grow as a biennial, meaning the foliage appears the first season as a low clump of leaves, followed the second year by the flowers. The leaves are deep green, leathery, and two to three inches across with a rounded or scalloped shape. 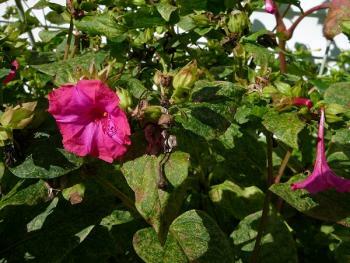 The three to four inch diameter flowers open sporadically all over the vertical stalks, which can grow anywhere from four to eight feet above the foliage. The round blossoms come in almost every color of the rainbow. They are hardy in USDA zones 2 to 10. Hollyhocks are quite drought tolerant and require very little care though the taller varieties may need staking to keep from falling over. 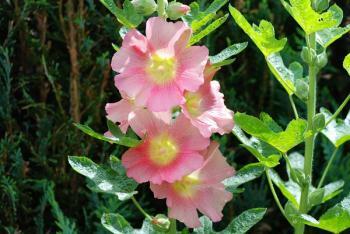 They can be found in nurseries with the bedding plants or grown from seed, which is widely available. Once they are established, it's generally unnecessary to plant them again, as new plants will sprout in the same area every year. At the end of summer the flower stalks may start to look shabby and can be cut to the ground. Just be sure to leave the plants that are still in their leaf stage - they will flower the following summer. Various insects feed on hollyhock from time to time, but none cause more than minor cosmetic damage and can generally be disregarded. Much more worrisome is a disease called hollyhock rust. This appears initially as small yellow pustules on the undersides of the lower leaves and can quickly spread to cover the entire plant, making it quite unsightly. If it's noticed in the early stages, removing and disposing of the affected leaves is an effective way to keep it from spreading out of control. If it progresses, fungicides like sulfur dust are the only means of control. Thinning the plants to improve air circulation is a good preventative. Hollyhocks exude the classic charm of a rambling cottage garden and are typically used at the back of a perennial border, where smaller species can hide the often unsightly lower portion of the plants. For the best effect, plant them against a wall of a complementary color (whether a structure or a hedge) to make the flower color pop out from the background. 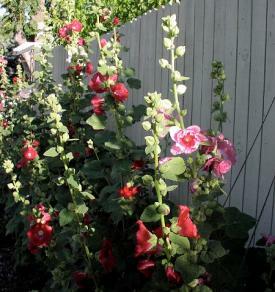 Hollyhocks vary in height and flower color. 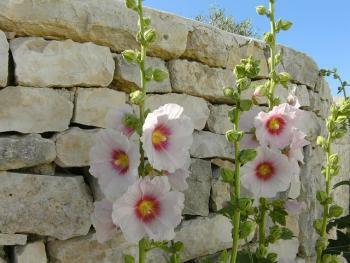 'Powder Puffs' is a mix of double-flowered hollyhocks in pink, white, yellow, and purple on six to eight foot plants that are hardy in USDA zones 3 to 7. 'Summer Carnival' is a similar mix, but the plants grow to only four feet tall; it's hardy in USDA zones 2 to 9. 'Nigra' grows to five feet and has deep purple flowers that almost appear black. It is hardy in USDA zones 3 to 7. 'Magenta' grows up to nine feet tall with deep wine red flowers and is hardy in USDA zones 2 to 10. 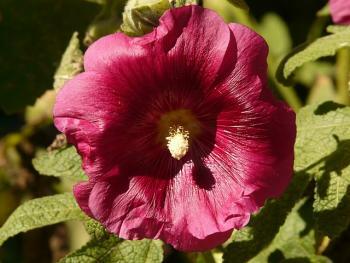 Hollyhocks are one of those flowers that never seems to go out of style. There are many varieties to choose from in seed catalogs, but many gardeners simply pass the seeds of their favorite varieties around from friend to friend.